White for Day. Black for Night. Whilst we all wait none-too-patiently to pull on the white linen trousers and gaze admiringly at the freshly polished spectators poised on the shelf, I thought I’d take a moment to look at the flip side. Let’s think in terms of black and white. But what about the opposite end of the spectrum? How do you feel about all black? Stylish or no? I think stylish. But let me clarify my position. I saw two women today who were dressed in all black, aside from belt, bag and shoes. Could a man pull that off for a casual night out? Yes and no. Exhibit A. Far better is a more casual approach. At least in my opinion. Add one part black, flat-front trouser in cotton (chino) or linen. 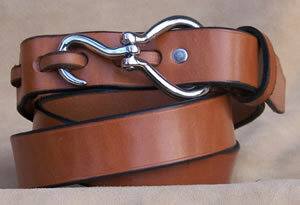 Finish with ADG’s brown hoof pick belt. And a pair of saddle tan leather sandals, at the beach, or driving shoes in town. Since it’s summer, don’t forget the sunglasses… tortoiseshell or gold rimmed aviators to show off the tan. Happy Memorial Day weekend. Search the site for the perfect burger recipe! This entry was posted in Elegantology, Uncategorized and tagged ADG, Brad Pitt, Casual summer dressing, hoof pick belt, Land's End, Memorial Day, Polo, Tod's. Bookmark the permalink. 9 Responses to White for Day. Black for Night. If your name is Johnny Cash, go for it. Otherwise be prepared to be asked repeatedly if you “work here”, ie waiter, bouncer, navy seal, burglar, etc. All dark is fine, but al black is a bit tough to pull off. Havent seen a guy pull it off outside the above mentioned positions. I like it. I like the all-black look and have rocked it at local cocktail establishments for years. In the summer, when I’m tan and my hair turns blond(er), the all-black ensemble turns heads. And not in a “Are you a waiter/bouncer/navy seal/burglar?” kind of way. The photos of Mr. Pitt above look foolish–an attempt at trying to look important and cool when you’re just a pretty face. The fellow just doesn’t have anything else to offer, and dressing in all black, well . . . you really have to be extremely cool or extremely important (like James Bond or a for-hire professional gun man involved in highly complicated international affairs who is wired at all times) to even consider wearing the all black look. Maybe Jack Nicholson could wear this look with his sunglasses to the Academy Awards, but I can’t think of many other men who should be wearing all black. It is so self-important. The casual approach you describe, with simple brown accessories, short sleeved polo shirt, and pants that are casual, too, is handsome. I don’t like Pitt’s all black look. The same suit and tie with a white shirt would have been more civilized, classic, and less self-conscious. Not a fan of the black slacks and polo, although there are definitely situations where it is a useful and appropriate look, such as a casual summer evening party. 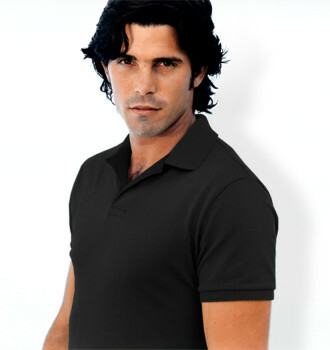 A black polo shirt must be worn with caution…it has to look new and without a hint of fading (delicate handwash only with other darks), and unfortunately depending on one’s scalp, shows falling hair and even a small bit of dandruff. It should be trim but not tight; the current Ralph Lauren presentation of polo shirts is absurdly tight and cannot be worn in this manner by most guys. I can never understand the attraction to the driving shoe. They give most people an unattractive flat footed stance…90% of the population looks better in footwear with some support and much needed height. A similar, better look would be a Weejun-type moccassin in a light colour, softer leather, or perforated for ventilation. For the belt, I think I would prefer woven or braided leather or woven fibre with leather tabs where the buckle is affixed. The belt shown is attractive, but I would like it better for days that aren’t dog. This is a great topic for discussion. Such fine nuances of ensemble are not given much consideration, but really can make one look right for an occassion or circumstances. Amazing how even supposedly people in the know look badly/inappropritely dressed. Just look at the New York Social Diary. Best wishes for a fun-filled spring into summer social season! Thanks to Square with Flair for mentioning the problem of men wearing too tight polo and casual shirts–I agree that they look absurd. The tight look suggests narcissism. SwF, you raise good points. The polo I showed is the classic cut, so as not to be too trim. I love driving shoes, espadrilles, boat shoes, Belgians and other unstructured footwear for casual wear. The alternative you suggest — the perforated leather loafer — is a very elegant choice. 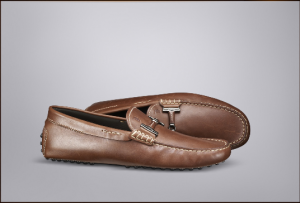 The look suggested is for extremely casual evenings and I think that the brown accessories make the difference in the style quotient. Barima, I do wear pleated shirts as well. For a while I stuck with the thin pleats, but have recently returned to the wider ones. brad pitt does not look good in all black because it’s not his season. tom cruise pulls of the all black look in mi3. he is a winter i believe. i wear black jogging pants and a black t with a dressy black croc watch that is better suited for black tie than lounging around the house. black sunglasses too. black looks good on me but i’m a winter too. I am not realy big on the all black look! Reminds me of gangsters somehow! Do like to see the casual black polos, merinos, etc.